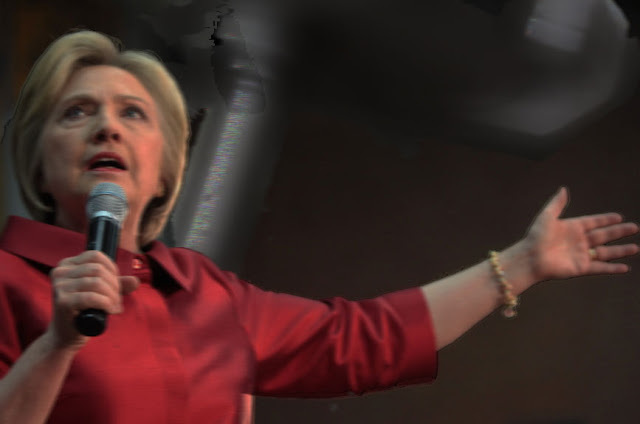 Presidential candidate Hillary Clinton delivered her concession speech at Clow UFO Base following her narrow loss in the Democratic Party’s Interplanetary Primary. Though some polls suggested she could win the Interplanetary Primary, Clinton lost by 5 votes. This was the closest Interplanetary Primary result since Mike Gravel defeated then Senator Barack Obama by 100 votes back in 2008. Sources within the Clinton campaign say she will not contest the result. Despite the loss, the crowd enthustically greeted Clinton following an introduction by popular galactic blogger Stephanie Zvan. Much of her speech was spent attacking Donald Trump. Later in the speech, the crowd started cheering, “Feel the Bern,” after a Sanders supporter took over the audience promoter screens. Security removed the man. Hillary collected her self for a few seconds before responding. “You know, there are many good people who supported my former opponent in the primary. I look forward to meeting with them, and adding their energy and enthusiasm to our campaign. I’m not going to talk about them now. I’m going to talk about the Berniebros and their allies, the Berniebabes. They don’t care about running a country. They just want our country to burn, and I don’t want our country to burn. I want it to be a burning beacon of hope! After the speech, Clinton had a short meeting with alien ambassadors and business leaders, before flying back to New York. She is expected to take a short break before the final primaries in early June.